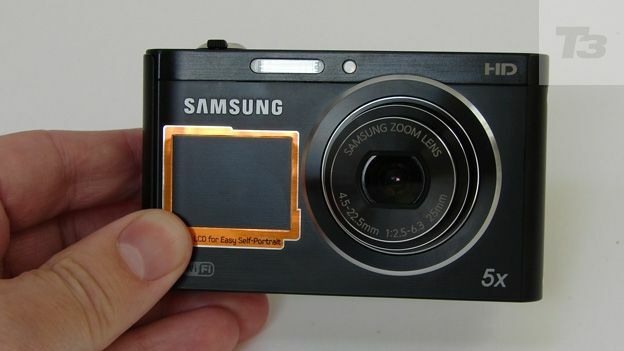 The Samsung DV300F 16-megapixel 5x optical zoom compact camera features front and back screens plus Wi-Fi. Is that enough for us to 'connect' with it? Compact fully automatic cameras with 5x zooms are commonplace and, some would argue, are in the greatest danger of being made obsolete by the smartphone. Luckily then compact and slender Samsung DV300F pocket camera offers a bit more than most comparable sub-£200 snapshots, like some of those found in our list of the best digital compact cameras. It boasts wireless Wi-Fi connectivity for transferring snaps to your PC and uploading them to social networking sites, plus, in a feature thus far unique to Samsung, dual LCD screens. We get a main screen at the back for shot composition and review as usual, plus a smaller postage stamp-sized LCD at the front. The latter is there to aid self-portrait shots, or keep junior subjects mesmerised. In fact Samsung says the DV300F is its first camera to feature its '2View' screen set up plus Wi-Fi into the bargain. The headline resolution here is 16 megapixels, and yes the zoom is a modest 5x optical. That said it does start wider than most at an equivalent 25mm in 35mm film terms – so it's useful for those landscape shots and group portraits – and runs up to 125mm when fully extended. The maximum lens aperture is also a brighter than average f/2.5 – so in theory lets in more light than many others in its class. Add in a svelte yet solid-feel build, a smattering of digital effects and funky extras and the £179 suggested price feels about right. As with most pocket snapshots, the control layout of the DV300F veers toward minimalist, with here all-black buttons on an all-black body, and small buttons requiring fingernail precision at that. The standout button by virtue of being silver is the shutter release button on the top plate, which here is familiarly encircled by a lever for adjusting the zoom. A press of the small power button activates the camera, ready for its first shot in around two seconds. With the LCD screen taking up two thirds of the backplate, the rest of the controls are ranged to the right and are small enough to require fingernail precision. In the absence of a shooting mode dial there's a 'home' button instead, though we do also get dedicated playback, delete and menu buttons, so the essentials are there. A control pad features settings for flash, close ups, adjusting the screen display and selecting the self timer, while a press of the central 'OK' button effects such changes. The menu options are clearly presented as a toolbar that extends over two thirds of the screen, but its opaque background means that it doesn't obscure the subject totally if you're adjusting settings whilst lining up a shot. As mentioned at the outset, the DV300F is unique for that fact that it has two screens, front and back. The 1.5-inch screen on the faceplate with its lowly 61,000-dot resolution is there for correctly lining up self-portraits – but suffers in sunlight, whereupon the view looks particularly dingy. The larger 3-inch 4:3 image aspect ratio back screen with better 460k dot resolution is there for everything else. A press of the 'F.LCD' button on the camera's top plate switches the front screen on (or off); thankfully it's not on all the time, thus avoiding drawing unnecessary attention as well as needlessly draining the battery. The easy to use, top pocket-sized Samsung DV300F comes packing a BP88 lithium ion rechargeable battery, inserted into the narrow base of the camera. The battery compartment is shared with a slot for removable microSD card, more commonly used in phones than cameras, though because the teeny card is the size of a fingernail it's fiddly to actually retrieve. Battery life is good for around 260 pictures from a full charge, or approximately 80 minutes of video. While pictures from the DV300F pack in plenty of colour, they are rather soft on close inspection, being the product of a small lens and small 1/2.3-inch sensor like most pocket cameras. However this fact does partly disguise any appearance of noise at higher ISO settings, though the maximum ISO3200 does look distinctly watercolour-like and painterly. As with the simultaneously released Samsung WB150F, on the DV300F Samsung is offering 1280x720 pixels HD video with mono sound at a capture rate of 30 frames per second (fps), rather than the Full HD 1920x1080. Pay a little more for the WB850F model to get Full HD. However the DV300F misses out on a dedicated video record button, so this mode has to be first selected on-screen before shooting commences with a press of the shutter release button. Fortunately the optical zoom can be used when shooting movies, but the built-in mono microphone, typically for a camera in the DV300F's point and shoot class, does pick up the sounds of the user's fingers moving around the bodywork, better disguised by busier/noisier scenes. Every camera needs something to distinguish it from all the others, and if that's not the ability to claim a world first then some other gimmick needs to be sought. If you're always chopping yourself out of frame when attempting self-portraits, the front-mounted 1.5-inch LCD screen of the 16 megapixel, 5x optical zoom Samsung DV300F could end that frustration, even if its appearance is rather murky if you're using it in sunlight. On a positive note the 3-inch monitor has a higher than average 460k dot resolution, plus integral Wi-Fi brings usability closer to that of a phone and extends options for how, when and where you download or upload those images. But while a cut above your average £150+ snapshot the DV300F may be, this remains a snapshot nonetheless. Still, it ticks the right boxes by being small and unobtrusive, whilst being easy to use into the bargain and relatively inexpensive at £179.